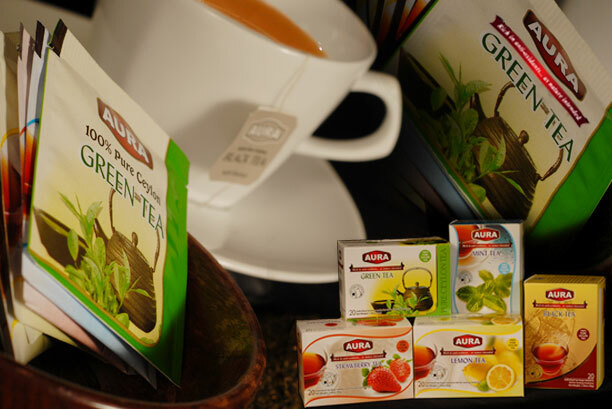 Aura teas provide benefits for healthy and active lifestyles as they are rich in anti-oxidants such as Flavonoids called Catechins, as well as vitamins C and A.
Sourced from immaculately maintained sustainable tea plantations in Sri Lanka and filled with natural goodness, the Aura cup of tea epitomizes the perfect cup of tea. Made from fine and tender leaves, carefully hand picked and processed to high quality standards, we guarantee 100% Ceylon tea each time you enjoy Aura tea. Aura gives you the choice of several delightful flavours to choose from, So that you can get the best of happiness and health! Be it Black, Green, Mint, Strawberry or Lemon, you are assured of the goodness of natural anti-oxidants when you sip our flavoured teas. Aura teas provide benefits for a healthy and active lifestyles as they are rich in anti-oxidants such as Flavonoids called Catechins, as well as vitamins C and A.
Anti-oxidants are known to protect your body against harmful effects of cell-damage brought about by free-radicals produced in the body. Each time you enjoy a cup of Aura tea, you give back to the village communities in Sri Lanka, whose dedicated work brings you the delightful range of Aura teas, for as a socially responsible company we are committed to the well being of our tea plantation staff and their family members.